Moscow, saying that it wants to see Washington take a more constructive approach toward maintaining security in the Black Sea region, has slammed the visit of a US guided-missile cruiser to the Batumi port in Georgia. 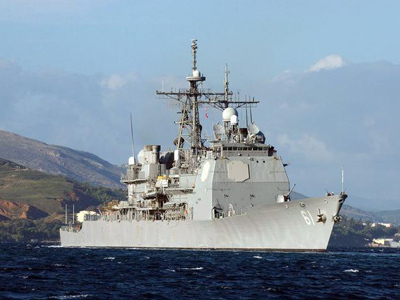 ­"The ongoing maneuvers of the USS Monterey, a guided-missile cruiser equipped with the Aegis system, within the Black Sea area are raising more and more serious questions," the Russian Foreign Ministry said in a statement on Tuesday. The Foreign Ministry had earlier expressed its concerns that as negotiations over a European missile defense shield are still in progress, it sends a disturbing signal that a reconnaissance operation is being conducted in close proximity to Russia’s southern flank. "Now this warship has demonstratively docked at the Georgian port of Batumi," the statement said. Russia has warned its European partners and NATO in the past that the construction of a missile defense shield in Eastern Europe without Russia’s direct participation would be viewed as a threat to national security. The USS Monterey is an integral part of that missile defense system. The USS Monterey has hopscotched across the region before its arrival in Georgian waters. The warship was dispatched in March to the Mediterranean Sea as the first stage of the US-led missile defense shield. Later, in June 2011, the Monterey – with 43 officers and 323 enlisted personnel onboard – arrived in the Black Sea to participate in multinational military exercises, codenamed “Sea Breeze 2011,” co-hosted by Ukraine and the US. Those exercises will be followed up by joint exercises with Georgia as part of the “Phased Adaptive Approach” program, designed to coordinate the expansion of the European arm of the global missile defense system until the year 2020. In addition to adding another hurdle to the missile defense talks, Moscow is concerned that an American warship docking at a Georgian harbor will only encourage Tbilisi’s reckless behavior. "Whatever explanations are given as to the purpose of this visit, it is clear that the Georgian leadership will perceive it as a sign of approval for its revanchist aspirations in relation to Russia’s allies, Abkhazia and South Ossetia, and so this will not help improve stability in the region," the Russian Foreign Ministry said. "The matter doesn’t just pertain to a one-off visit of a U.S. ship to Georgia," as the USS Anzio called at a Georgian port on June 9, it said. The Foreign Ministry’s statement mentioned Washington’s delivery of “humanitarian aid” to Georgia following the latter’s brazen military assault on North Ossetia on August 7, 2008, which led to a 5-day conflict between Georgia and Russia. "This is reminiscent of the large-scale delivery of so-called humanitarian aid on board US naval ships to the Georgian authorities by the George W. Bush administration after the Georgian attack on South Ossetia in August 2008 failed," it said. "Such maneuvers go against the current tenor of Russian-American relations," the Ministry continued. "We expect Washington to take a more constructive approach consistent with the goals of maintaining security in the South Caucasus and the Black Sea region on the whole while respecting the legitimate interests and concerns of all countries located here," it said. The Bush administration enthusiastically pursued a ground-based missile defence system in Eastern Europe, going so far as to withdraw from the 1972 Anti-Ballistic Missile Treaty with Russia in 2002. This ended the so-called “mutually assured destruction” guarantee that had existed between the former Cold War enemies . In Sept. 2009, the Obama administration announced it had “shelved” his predecessor’s plans for a missile-defence radar in the Czech Republic and 10 interceptors in Poland, opting instead for land-based radars working in concert with Aegis missile-tracking ships. These would be armed with Standard Missile 3 (SM-3). Over time, the program would get more powerful (according to the so-called “phased adaptive approach”), covering all of European territory by about 2018. This "phased adaptive approach" is focused on advancing the currently sea-based Aegis system and its SM-3 interceptors, which are the anchor components of US President Barack Obama’s missile defense system for Eastern Europe. 1. Between now and FY 2011, procure more of the existing system. 2. Around 2015, develop more advanced versions of the SM-3 (the SM-3 Block IB) to provide broader coverage and deploy them on land. The initial emphasis will be to deploy these interceptors in southern Europe. 3. Around 2018, field SM-3 Block IIA interceptors, which are already under development, primarily to counter medium-range and intermediate-range missiles. This would include fielding interceptors in Northern Europe to protect U.S. NATO allies in Europe. 4. Around 2020, deploy SM-3 Block IIB interceptors to counter long-range ballistic missiles that could threaten the U.S. homeland as well as regional allies. The USS Monterey will stay in Georgia’s Black Sea port till June 23, according to the US embassy in Tbilisi. Incidentally, June 22nd marks the 70th anniversary of the Nazi invasion of the Soviet Union in 1941. Certainly some Russians will not fail to see the coincidence of the arrival of the USS Monterey in Georgian waters happening on this Day of Memory and Grief.